​Gene therapy research in the Barry Lab at Mayo Clinic has been supported with funding from the Organic Acidemia Association, the Propionic Acidemia Foundation, as well as by the Mayo Clinic Center for Regenerative Medicine. Our work has focused on developing a mouse model of propionic acidemia (PA) that can be used for basic study of PA disease and development of gene therapy vectors for treatment of PA. The original mouse model generated by Dr. Miyazaki at UT-Southwestern lacked both copies of the PCCA gene that encodes one subunit of the propionyl-CoA carboxylase (PCC) enzyme. This lack of PCC meant that the mice only survived 36 hours making analysis of disease processes or testing of therapies difficult. To create a more compatible model, we introduced a human gene encoding PCCA that had an A138T mutation that was identified in a patient with propionic acidemia by Dr. Ugarte’s lab at Universidad Autònoma de Madrid. In collaboration with Dr. Jan Kraus at the University of Colorado, we determined that the A138T mice have approximately 2% of normal PCC enzyme activity in their livers. Unlike the original PCCA mice with no PCC activity, most of these A138T mice survive to adulthood, but have very similar elevations of the same blood metabolites seen in propionic acidemia patients. These include elevations in propionylcarnitine and methylcitrate as well as increases in glycine, alanine, lysine, and ammonia. We have also observed evidence of cardiac dysfunction and possible heart failure in the mice suggesting that they also share this symptom. Our findings highlight the diverse nature of PA presentation. Elevations in circulating propionylcarnitine and methylcitrate are nearly universal in affected individuals, but other aspects of the disease are observed less frequently. Different organ systems are implicated in different people, for instance neurological symptoms are common and manifest as seizures, developmental delay, lethargy, and hypotonia. In the heart it is common to see arrhythmias and cardiomyopathy even in young PA patients. Many of these symptoms are worsened by noncompliance with protein restricted diet regimens or stress to the body caused by infection. Although dietary treatment has greatly improved the prognosis for PA patients, few other treatment options have been developed. Liver transplantation has emerged as a viable therapy option for PA, but transplant operations carry a certain degree of risk themselves. Anesthesia to begin the operation may by itself make this approach unsafe for certain PA patients. After liver transplantation, life-long immunosuppressant drugs will be needed to prevent rejection of the donor liver. Immunosuppression may also increase the risk of infections that may also drive metabolic crises. Given these issues, we have worked to develop safer and less invasive treatment options based on gene therapy with viral vectors. To date we have treated adult mice with adenoviral and adeno-associated virus (AAV) vectors expressing the gene for human PCCA. We demonstrated in an article titled “Generation of a Hypomorphic Model of Propionic Acidemia Amenable to Gene Therapy Testing” published in the journal Molecular Therapy (2013) that both of these gene therapy vectors significantly reduced propionylcarnitine and methylcitrate levels in the blood of the mice within one week of treatment. We are pleased to note that propionylcarnitine and methylcitrate levels have remained low for over a year-and-a-half after treatment with a single dose of AAV in male mice suggesting that the therapy can last for long periods. One practical note that may interest parents of children with PA is the fact that gene therapy in the mice appeared to rapidly improve the ability of the animals to consume normal protein-containing food. Indeed, within one week of therapy, the body weights of the animals increased drastically. This bodes potentially well for this approach having positive day-to-day impact should we be able to translate this towards treating PA patients. ​The varied presentation of PA across several organ systems has caused some investigators to examine where the cause of these symptoms lie. Previous studies have shown that certain protein complexes in the mitochondria of heart tissue are lower than in individuals without PA. Since the mitochondria are responsible for providing most of the energy used by cells in the human body it is thought that this could lead to a lack of energy available to the heart and result in cardiomyopathy. It is also unclear exactly what effect circulating levels of propionylcarnitine and methylcitrate have on the body and we are not sure to what degree different tissue types contribute to the circulating levels of these compounds. Our most recent study using our A138T PA mouse model was designed to help clarify some of these questions. In September of this year (2014) we published a new research article in the journal Human Gene Therapy titled “Effects of Adeno-Associated Virus Serotype and Tissue-Specific expression on Circulating Biomarkers of Propionic Acidemia.” Our group and others have observed that different serotypes of AAV are more apt to deliver genes into the liver, heart, or cardiac and skeletal muscles in mice. For example, AAV1 is better at delivering genes into muscles and AAV8 is better at delivering genes into the liver. We made these vectors totally specific to the muscle and liver and then compared how well they could treat the PA mice. Under these conditions, both vectors improved metabolic levels, but the liver-specific gene therapy reduced systemic metabolites better (Figure 1). In many ways, the AAV8 liver-specific gene therapy is analogous to transplanting the liver, except we perform a simple injection rather than invasive surgery and do not have to apply immune suppression. Conversely, gene therapy is more experimental than transplantation, so safety still needs to be evaluated. Reduction in the methylcitrate levels shown here is encouraging because it is hypothesized that high levels of methylcitrate in tissue could be a possible cause for the energy deficiency mentioned in the heart and has been correlated with high ammonia levels in the brain as well. 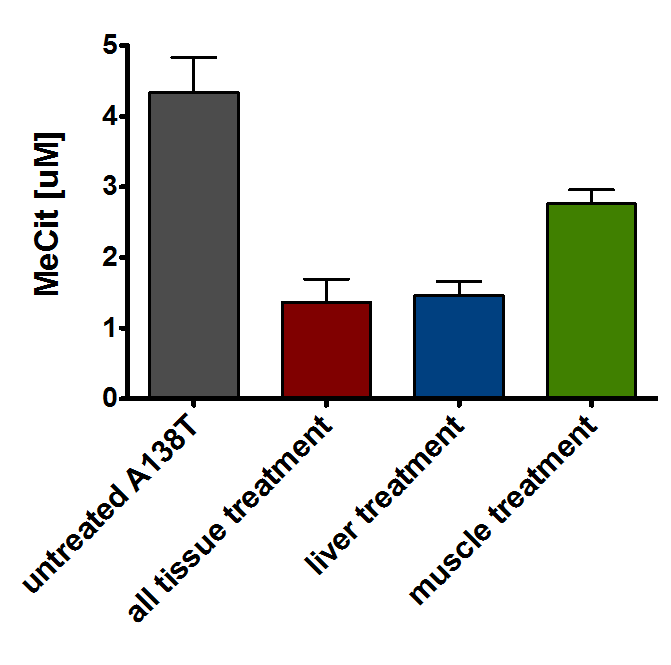 While liver-targeted gene therapy reduced metabolites in the blood better, in more recent work, we have found that the muscle-targeted vector was markedly better at repairing the heart. For example, AAV1-PCCA corrected signs of cardiac dysfunction, but AAV8-PCCA did not. These data suggest that gene therapy that repairs PCC in as many tissues as possible is better than therapies that only repair it in one site. This is consistent with observations that liver transplantation can blunt certain symptoms, but may not always improve others like cardiac effects in PA patients. ​Since the liver is the main metabolic organ in the body, it will need to be treated by gene therapy or by transplantation. These studies also demonstrate that there are potentially harmful compounds being produced by the muscles and that gene therapy in the muscle reduces systemic metabolite levels, but also reduces cardiac symptoms. These data suggest that tissue targeted gene therapy or transplantation are not the best approach to address the spectrum of PA disease effects in different tissues. Therefore, we are moving forward to improve AAV vectors that deliver genes to many tissues after intravenous injection. In addition, we are working to use the mice to better understand the neurologic consequences of PA and to determine if direct neurologic gene therapy will be needed. Our PA mice have a number of symptoms that indicate that the disease is impacting their brains. Since we can’t speak to the mice, these symptoms are unfortunately difficult to assess. We are therefore embarking on a number of studies to explore if the A138T mice are a good model of the neurologic aspects of PA. The mice have high levels of ammonia in their bloodstream and we are working to determine how the circulating ammonia or methylcitrate produced locally in the brain may affect the disease. There are similar questions to those we have addressed in the heart that must be addressed in the brain as well. Do we need to treat the brain specifically or will systemic treatment of the liver and muscles alleviate brain symptoms? What is the most effective way to treat the brain with gene therapy? Fortunately the AAV vector system will allow us to explore different options, and we have excellent collaborators that are helping us address these issues. Figure 1. Methylcitrate correction after tissue-specific treatment. Methylcitrate levels were measured in the blood 45 weeks after injection with AAV vectors capable of expressing PCCA protein in all treated tissues, or specifically in the liver or cardiac and skeletal muscle.